The Greater Swiss Mountain Dog is mighty and majestic, with a large size that is impressive but no cause for alarm—these gentle giants are excellent family pets. They are often confused with the similar-looking Bernese Mountain Dog, but Greater Swiss Mountain Dogs are significantly larger with a much shorter coat. Affectionately referred to as Swissys, these dogs were originally bred as working dogs to herd cattle, pull carts, and serve as watchdogs. They love being busy and having jobs to do. Their friendliness, trainability, and strength have led to their success as therapy pets and search and rescue dogs. Naturally protective of those they love, they make wonderful, loyal guard dogs. However, though their bark is menacing, their bite is relatively nonexistent. With Swissys, intimidation is key. Greater Swiss Mountain Dogs are one of Switzerland’s oldest dog breeds. Experts theorize they descended from very large mastiff-type dogs brought to the Alps when the Romans invaded Switzerland some 2,000 years ago. As industrialization grew and farmers ceased relying on working dogs to help out on farms, the Greater Swiss Mountain Dog breed nearly disappeared. However, in 1910, the breed was recognized by the Swiss Kennel Club, launching a breed club and sparking new interest in the Greater Swiss Mountain Dog. Their population grew slowly and they remained a rare European breed. 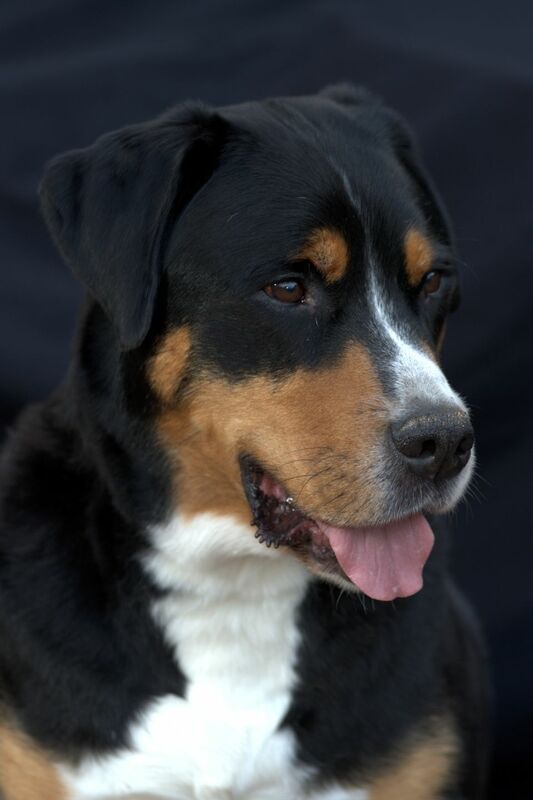 Fifty years later, the Greater Swiss Mountain Dog was brought to the United States. In 1995 it was recognized by the American Kennel Club and the Greater Swiss Mountain Dog Club of America was formed, promoting careful, selective breeding to increase the strength and popularity of the big, beautiful canines we know and love today. Greater Swiss Mountain Dogs can be boisterous, forgetting about their large size and neglecting manners. To avoid this, make sure to begin obedience training when they’re puppies. Luckily, this big breed is exceptionally food motivated, making training easier. They respond well to positive, reward-based training using small training treats or even pieces of kibble. They’re not picky. Swissys are quite intelligent, which can be both a good and bad thing when it comes to training. Instead of strictly obeying, they can begin to think independently. That’s why short and repetitive training sessions tend to work well. After a short training session, bring your Swissy into the great outdoors for a romp in the woods or a game of fetch. Because these dogs originated in the Swiss Alps, the woods is their natural habitat. Plus, with their large size, the outdoors may be the only place they can stretch their legs and run freely. Though they are athletic and full of energy, Greater Swiss Mountain Dogs don’t require an enormous amount of exercise. A daily walk or game of fetch is enough to satisfy them. Greater Swiss Mountain Dogs will even enjoy a romp outside when the temperatures dip down in the winter. They have thick double coats to keep them nice and warm while they play. In warmer months, Swissys do shed their undercoats. Regular brushing and bi-annual de-shedding baths will help keep their massive amounts of fur off your furniture. When they aren’t shedding, you can stick to occasional baths and brushings as needed. While they have no breed-specific disorders, Greater Swiss Mountain Dogs are prone to health problems that many large-breed dogs face. Due to their large size and weight, orthopedic problems like arthritis can arise. Typically, though, Swissys have great bone health. Bloat is always an issue with large-breed dogs as well, and especially with Greater Swiss Mountain Dogs due to their fondness of food. If they eat too fast, it could be fatal. Owners should know the symptoms of bloat and have a plan of action in case it happens. If you find your Swissy from a breeder, make sure the breeder shares proof of the puppy's health screenings, especially the OFA-Canine Health Information Center screening. These dogs love food in any form—raw, dry, or wet. However, overfeeding can lead to digestive problems and obesity (which can lead to orthopedic issues) so it’s wise to avoid overfeeding. Feeding your dog dry kibble may help clean his or her teeth as the friction works to remove plaque. On the other hand, wet food may be easier to digest. Many experts also rave about the health benefits of a raw diet. Ultimately, it’s up to you and your pup, in consultation with your veterinarian, to find the diet that works best. No matter the type of food you decide on, stick to brands that list whole, healthy ingredients. Lean meats high in protein support healthy large dogs, so look for food brands that list those as the first ingredient. Stick to foods with limited additives and whole vegetables, grains and fruit. The Greater Swiss Mountain Dog Club of America posts classified ads of breeders throughout the U.S. and Canada. The club does not endorse or regulate the practices of these breeders but rather provides the classified ad service to any club member who has been in good standing for a minimum of two years. The GSMDCA recognizes one rescue foundation, where you can apply for adoption. Before you decide on a Greater Swiss Mountain Dog, be sure to do plenty of research. Talk to other Swissy owners, reputable breeders, and rescue groups to learn more. There is a wide variety of dog breeds out there. With a little research, you can find the right one to bring home.